Known as 'La Perla del Pacifico', Mazatlan is famed for it's beaches, food, fishing, climate and people. Here is a general collection of photos taken from various visits over the last 10 years. Mazatlan after sunset. Here is a view looking southwest from near the Monumento al Pescador. 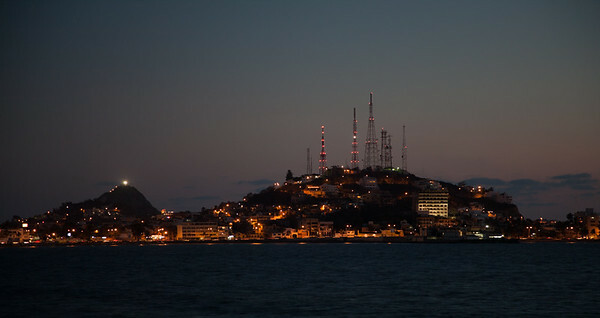 On the right, Cerro de la Nevería (with radio masts) and to the left the light from El Faro (the lighthouse) is visible. This photo was actually taken back in March 2009 with my original Canon 5D and the trusty 24-105mm which still survives although it has been repaired and rebuilt after various incidents such as being banged on rocks during boat landings. The exposure was 0.5 sec at f/4.0; ISO 200.